NASSCOM Product Conclave is scheduled to happen from October 29 – 30th 2013 in Bangalore and we at OCC Bangalore are giving away a few free PASSES. You have to answer the above question in the group so that fellow members can also learn from your perspective. We understand that few members can have same responses. Hence, we will randomly choose the winner. Thus it is not about the best answer, anybody can win.But yes do respond sincerely. So we are now done with the 101st OCC Bangalore meet. Even though it was a long weekend, we had a gathering of 35 members turning up for the event. It was a “generic meet”, which means there was no agenda and the entire agenda or discussion was a result of the introduction / pitch made by the member. Overall it was a great meet with lots to learn and connect with the old and new members of the group. Entrepreneurs from various industry segments were part of the meet. To name some of these segments we had representation from Social Media, Brand Advertising, Travel Experience, Accounting, Business Card and Relationship Management, Finishing Schools for Engineering Grads, Recruitment, Business and Financial Consultants, India’s first Luxury Auto Rickshaw (The Rick), Mobile and Software Development Services, Clean Tech, eCommerce (co-operative loyalty), Retail (brick and mortar). We had our 100th Meetup as part of OCC Bangalore on August 10th. 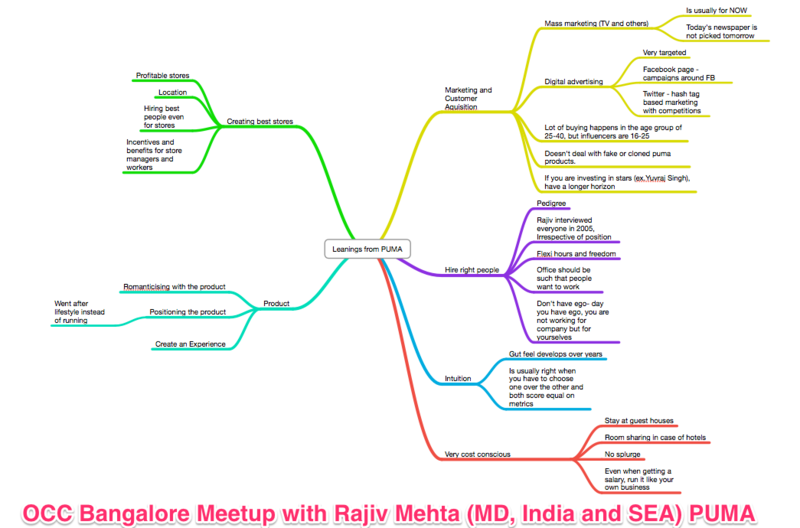 I tried to capture some notes from the meetup and have presented them as a mindmap (yes, i use mindmaps big time). Click on the image below to get a larger image. NASSCOM Product Conclave is here and like every other year OCC Bangalore is an important ecosystem partner for the event. As part of our partnership with NPC, OCC Bangalore members can avail a discount of INR 500 by using the coupon code ESPOCCNPC0025. 3. If you are a start-up select the Startup rate and quantity of tickets you want to purchase. 4. If you are non-start up, Select your membership category (Non Member) and Quantity.